Mahjong Trails Match is LIVE! Home » Mahjong Trails Match is LIVE! Hop into a new adventure! – Mahjong Trails Match is LIVE! Today’s an exciting day in the office because we just delivered a new baby… and it is a very special one! 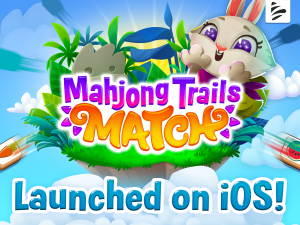 We are very proud to announce that Mahjong Trails Match is now available worldwide for IOS users! Are you ready? First of all, what is Mahjong Trails Match? Easy! It is the next evolution of our world-famous Mahjong franchise. But it is not just another Mahjong game, in case you are wondering. Our Team worked hard on revamping the classic Mahjong gameplay and created a brand new remastered and updated version for mobile! Awesome design, exciting new characters and unique levels. With Mahjong Trails Match our Mahjong Trilogy is now complete. This means, you can play the evergreen success Mahjong Trails on Facebook, you can play Mahjong Trails Blitz within the Facebook Messenger, and now Mahjong Trails Match on mobile! Oh… and did we mention an adorable bunny??? Join Tilly and hop into new lands of mystery and delight! Help her rescue her woodland friends from the villainous owl Singe tapping those tiles as fast as you can! Spread the word to your friends and see whose matching skills reign supreme! Are you ready for a brand new adventure? Download it NOW!